This is Christopher Peacock's much ballyhoo-d Refectory Kitchen. 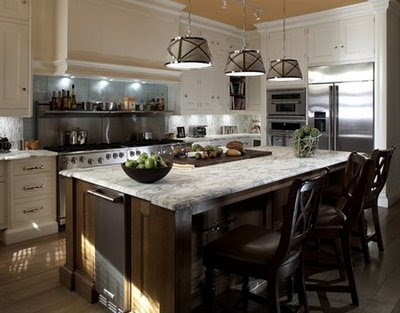 It is gorgeous and when he started pushing kitchen design in this direction, it was pretty revolutionary. 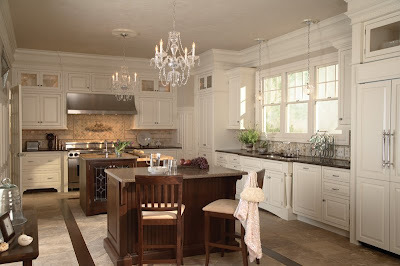 Before the rise of his Scullery and Refectory designs, the high end of kitchen design was all about Tuscan and other Vegas-meets-Disney interpretations of old world styles. Christopher Peacock launched himself onto the scene as an alternative to all of that noise and brought some restraint back to the world of high end design. Thank you Christopher Peacock. As lovely as the kitchen above is, it has a price tag on it well into the six figures. It is exquisitely fitted, finished, engineered, designed, constructed and installed. It is worth every penny he charges for it and it will last a lifetime. Several lifetimes in fact. Though by no means an inexpensive kitchen, here's a kitchen that would cost half what a Christopher Peacock would. This is a kitchen from Medallion and it's taking its inspiration from The Refectory directly, but it's not stealing any ideas. It's pairing a painted finish with a dark stained wood and if you look at the details, it's really a different kitchen entirely. It's also beautiful, well-designed, well-fitted, well-finished and a respectful homage. All design is derivative as I like to say, and this kitchen from Medallion is a more affordable version of an idea that Christopher Peacock had. But it's a version, not a copy and I think that's what makes what I call a good knock off.